Aaron Watson Interview: We talk about new music, his huge love for the UK and much more! 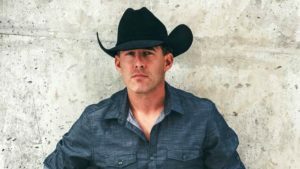 There haven’t been many bigger shocks to Music Row and its stranglehold over country music than Texan artist Aaron Watson hitting number one with his independently released album The Underdog in 2015. Following it up in 2017 was Vaquero, a record that hit number two and solidified his status as one of the most successful country artists around at the moment. With a new live album, Live at the World’s Biggest Rodeo Show, on the way in August and a trip to the UK for a full tour and a stop at The Long Road Festival, Aaron Watson is not slowing down! We managed to chat to him over the phone last month about his passion for the UK, new music and much much more! Quite a lot has happened since we last spoke, we sat down in Manchester last year on your UK tour ahead of the release of Vaquero, it must have been a wild year and a half? It’s been crazy! Between the music and my family they keep me busy! No complaints though! It keeps you on your toes having kids around! I’ve just had to lock two of them out of this room! Oh yeah! It makes life worth living! Vaquero dropped last year, how did you find the reaction to that record? I felt that it had the best reaction to any album we’ve had yet. The album sold 30% or 40% more copies than even The Underdog did! It charted at number two but it was the top selling album that week. It just didn’t have the streaming single, now they do the chart a little bit different but it was our greatest album success to date. I think it was a very important release because a lot of people in the mainstream music industry, I think, thought that we were just a one-hit wonder with the success that we had with The Underdog. Album sales have declined 30% from the time we released The Underdog but I think our album sales increased by 30%. It was just so much fun! Getting the write the songs, I just really enjoyed putting out Vaquero, I’m working on another album right now and I think that I’m beginning to come into my own as a songwriter. It’s exciting, you know? 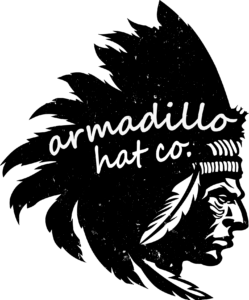 We’ve worked really hard to get to this point and we’re just loving it. For us, it’s all about the fans. I feel like the UK has been a really big deal for us. A lot of artists don’t want to make their way over, for me, I always felt that it was really important to take the time to tour in Europe and the UK especially. The fans over there are so into the melodies, the music, the lyrics, the passion for a song in the UK is unmatched. That’s what I was going to ask you, I know that you do a lot of stuff in Texas and across the USA but you really seem to have made a beeline for the UK. Do you think that connection with the fans is what really makes it work over here? Do you think it makes a big difference that you are the songwriter? Yeah, I think it makes a big difference. I’m a music lover, I took my family to see Paul McCartney last summer and to hear Sir Paul get up there and tell the story behind the song. It’s so intimate and personal and real. I don’t get anything out of seeing some singer get up there and just sing some song that somebody else wrote, it just doesn’t do anything for me. I think that without the support of the UK we wouldn’t chart albums number one. I think that the UK has been such an incredibly ally of ours and I love coming over. I love the culture, the people, it was probably three or four generations ago that my family was living there! The old Watson’s! Yeah, one side of my family is from England and my mothers side is Pennington, so Irish. That’s probably the reason why I feel at home. It does feel that way during your shows over here, it must be difficult being an artist from Texas and travelling thousands and thousands of miles to play music? You must wonder if it’ll resonate with crowds and it must be a fantastic feeling when it does? Oh it is. I will always always always come to the UK. It’s as important to me as us doing our west coast runs up through California, Oregon and Washington here in the States. What I really enjoy is that, right now things are crazy, my kids are at an age where they’re very busy with sports and school but just think, some day, when my kids are grown, how fun will it be for me to bring my whole family with me to the UK and let them experience the beautiful country?! That’d be some family holiday! You know exactly how they are then! They want it all and they want it now, much like their mothers! Very true! Another interesting thing about your upcoming UK tour is that you’ll be playing your first festival over here, that’ll be a bit different and probably a good chance to play in front of some fans that might not have seen you yet? Yeah, festivals are great because it gives me an opportunity to share my music with a larger crowd, it’s like planting seeds. We plant seeds and the next time we come back to the UK, those people who we saw at those festivals will come to see me at my other shows. We just love it. I’m so looking forward to it. Coming to the UK is one of those things that, when we get it on the books, I really really really look forward to it. It’s such a treat! We’re just so thankful that you guys embrace us. You know what I think helps too? I think the fact that my last name is Watson and so many people assume that I’m related to Dale Watson! Dale has such a strong fanbase over there so I think that I need to send Dale a thank you card to thank him for sharing some of his fans with me! One thing I always like to ask is whether you have a particular favourite thing to do when you’re in the UK? Whether it’s eating fish and chips, pie and mash or whatever? I do love the fish and chips! I love the different types of eggs! Y’all love eggs and I love eggs! We have chickens at the house so I have fresh eggs every morning from my chickens. I just love all the different flairs, the cars, the buses. I love the way that things have changed with technology yet there’s still that old country feeling. On the east coast here in America we do have some, what we consider, old neighbourhoods, that’s like a new neighbourhood to y’all! Everything has such a long long history that goes back forever and I love the history! It’s just such a unique experience for us and I’m really open to the entire thing. For me, it’s like a kid going to Disneyland! It’s great to hear your passion! Switching back to the music, we talked about the album hitting number two but having such amazing sales, do you think it’s great to see that sustained chart success? You didn’t just get a couple of people who liked a tune on The Underdog and bought it, but you created so many more fans. It must be a real positive from Vaquero? Yeah. Where we kind of knew we were onto something was that the album before The Underdog, Real Good Time, we just put it out like any other album and we saw that it charted top ten. We didn’t do any promotion, we just put it out! The chart came out and there we were! What I’m trying to focus on is heart and soul, writing songs that make people feel good, that uplift them and they can enjoy. I don’t have time for negativity, this world has enough of that on its own. I have to say, as a record, Vaquero is one of the best I’ve heard in years. I love an album, something just works from start to finish and takes you on a journey. It’s funny, last time we spoke to mentioned how you’d been listening to the White Album by The Beatles quite a lot, I can really hear that at the end of Rolling Stone! It absolutely is. I’ve said this a million times but my children love the music and watching that develop over the last three or four years has got me refocused on who I am and why I make music. Let’s talk about this, let’s talk about the fact that my oldest boy Jake is 12, he’s been playing the guitar for about four years now and I come home one day and he’s got my Telecaster plugged in to my Fender Blues Deluxe and he’s playing Helter Skelter by The Beatles! I’m just going “yeah!” The thing about it is, when I’m listening to The Beatles, those albums are great from start to finish. There’s different moods and flavours. A lot of times country music wants to put me in this box, like this is how you’re supposed to sound, but I’m not going to be put in that box. I’m just going to make music that comes from my heart, I’m going to make my music and I think that the fans can feel what’s real. You mentioned that there’s new music in the pipeline, do we have any idea when we might start hearing some of that? Yeah. We’re going to put out a live album in August, it’s twelve tracks of songs that people have heard plus one new one on there, we’re going to put that out for fun! Then, my entire family, we’re working on a Christmas record that will come out end of October! It’s called An Aaron Watson Family Christmas, my wife is singing with me, my kids are singing with me, we’re having so much fun making this album! I go back in the studio in September to make a new country album and I’ve already written a whole album. This one… this is the one! It’s the one! I feel like I’m finally maturing as a songwriter! I’m sure that your fans will be thrilled to hear there’s so much in the pipeline! I bet it feels weird recording a Christmas album now, in the middle of a Texas summer?! It is so weird! I’ve got this one song that I’m writing and it’s called Lonely Lonestar Christmas, it kind of has a Sinatra feel to it. I was working on it the other day at the house, then I went outside and it’s 102 degrees! I’m like “wow, it’s definitely not Christmas time!” It is weird! I feel like you should have a room in the house with the air-con on, put a tree up and just make that room Christmas! That is brilliant! I sing a lot in my wife’s closet because, with all the close hanging, it makes for a really good sound for recording vocals. All those clothes take away the echo. You know what I’m gonna do? I hadn’t even thought about that, I’m gonna put a Christmas tree up in that closet and hang some lights up. When we go into there to sing it’ll feel like Christmas! Thank you for that, that’s brilliant! You’re getting all the credit for that buddy! That’ll help when Mrs Watson comes home to find a tree in her closet, just blame it on the guy who is thousands of miles away! Yeah! I’ll blame it on you! You and I can have this partnership, when my wife gets mad at me in Texas I’ll blame it on you and when your wife gets mad at you in the UK, you can blame it on me back in Texas! Sounds like a deal! Although next time I see you, I may have my pregnant partner with me and we don’t want to mess with her! Well, we can’t wait to have you back over here, it’s always a delight chatting to you and watching you play live! We’ll catch up in September! Absolutely! Blessings to you, your wife, your two kids and the one that’s on the way! 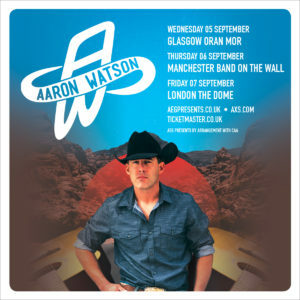 Aaron Watson heads to the UK in September. You can buy your tickets here! 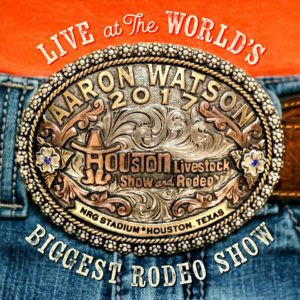 Live at the World’s Biggest Rodeo Show is released on August 24th! Pre-order it here!